Lentil soup is pretty much one of my family's favorites. It's comforting, healthy, and just plain delicious. One thing I love about cooking with lentils is that they are quick and easy to prepare - you don't have to soak the beans or let them cook for hours like most dried beans. Anyway, I've made many variations of lentil soup and this one did not disappoint. I adapted it from a Giada De Laurentiis recipe. The pasta made it extra good and we definitely enjoyed this meatless, hearty soup. It's heathy and easy - perfect for winter and perfect for these busy holiday prep days! Heat the oil in a large pot over medium heat. Add the onion and carrots and saute for a couple of minutes. Add the garlic, salt, and pepper and saute until all the vegetables are tender, about 5 minutes. Add the tomatoes (do not drain). Simmer until the juices evaporate a little and the tomatoes break down, stirring occasionally, about 8 minutes. Add the lentils and mix to coat. Add the broth and stir. Add the thyme. Bring to a boil over high heat. Cover and simmer over low heat until the lentils are almost tender, about 30 minutes. Return to a boil and stir in the pasta. Simmer until the pasta is tender but still firm to the bite, about 8 minutes. Season with salt and pepper, to taste. To serve: sprinkle with the Parmesan cheese and drizzle with olive oil. I would like to freeze and store more soups. 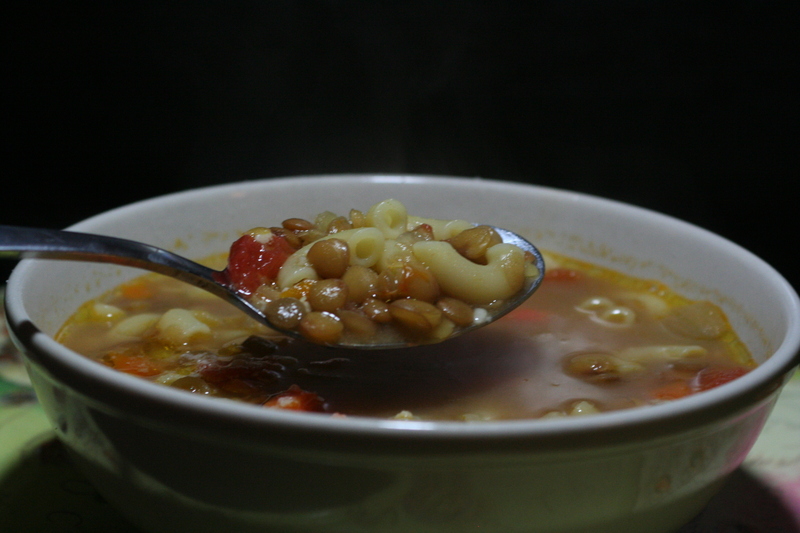 Do you think that the Lentil Pasta soup and the Curried Lentil soup would be good for freezing? What are your top three choices (best performers!) for frozen-storage soups? What are your recommendations for freezing soups? I think it would freeze okay but I would probably not add the pasta before freezing - just cook it when you reheat the soup. I think the curried lentil would freeze okay as well. I have not frozen either, though. I would avoid freezing potato soup - it just doesn't do very well in my opinion. My top 3 to freeze would probably be chili (this is absolutely my #1 favorite- it does so well in the freezer! ), bean soups (like black bean or pinto or a mixed bean soup), and vegetable soup. I don't have tons of experience freezing soup simply because I don't do a lot of freezer meals. Just make sure and leave plenty of room for the soup to expand in the container. And I would use within 3 months. Oh, you can also freeze soup in bags to help with freezer space - just make sure to cool it first. That makes them stackable! Feel free to let me know if you have more question!